A recent gathering by my local whisky club hath reminded me of the title verse from a poem by Robert Louis Stevenson, and during a quiet night session with this 25 year malt, I couldn't agree more... for now anyways. 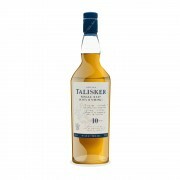 Talisker has had a remarkable track record for consistent quality in my estimate - I've gone through numerous bottles of the 10 year, and I've found them all to be highly enjoyable; I could say the same about the 18 as well as a number of the distillery editions (here's where I really wish they would do more age stated releases as I absolutely refuse to buy any of the NAS releases due to principle) The 25 is no different - I've been lucky enough to try one other variation, and although I enjoyed that one more, it did have the advantage of being cask strength whereas the one I'm reviewing today is a still respectable 45.8%. Well, it's a nice quiet cold night as a typical Canadian winter night, so what better activity to do then a write up of a classy whisky? Nose: Pleasant old mustiness... old wooden bookshelf I would think. 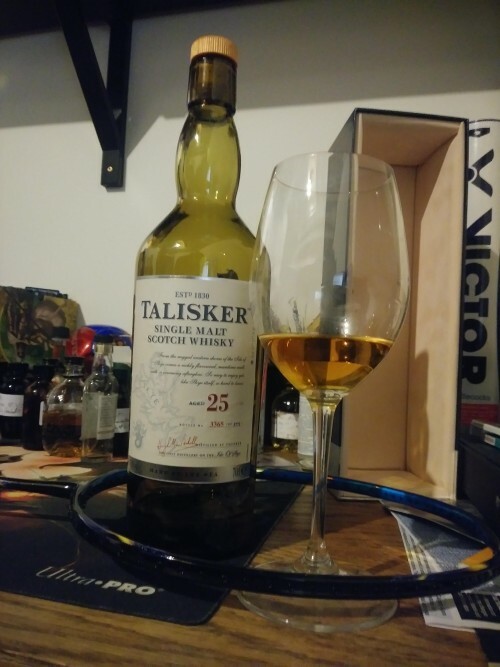 Citrus: something in the orange family but creamy.... could almost think an element of orange creamsicle, light delicate smoke, saltwater, eventually the familiar Talisker white pepper emerges, but even then, it's almost a softened take on it if you will. Take your time with this one - it needs a few iterations to suss out what you're getting, but the elements are nicely interwoven, and very enjoyable: I'd call it a nose that just keeps on giving. Palate: mmmm OMG wow, this is where it's at. Mouthgasm. This is whisky at the apex of its maturity. Delicious tropical fruit juice. BBQ'd skewer of fruits comprised of pineapple, apples and mangoes. Light peppery smoke teases at the edges of each sip. The texture caresses your mouth, it takes your tastebuds by the hand, and gently guides it on the journey of becoming a man.... that one night, it just made everything alright. This finish may not be long enough - I want it to last forever. Drinking this makes me as happy as a.... guy drinking Talisker 25. That's right. So much happier than a clam could ever be. Loved this. It's still a killer value for the money too - it's cheaper than the Laphroaig 25, the Glengoyne 25, the Springbank 25, yet I'd argue that it can more than stand its own ground in the pantheon of 25 yr whiskies. (and where I live, it's still fairly available). This is one that does the Isle of Skye proud. @Mackstine Sounds delicious. When you say “killer value...” what are we talking dollar wise? Here in BC the Ten is now over $100, I can’t imagine the 25 being remotely affordable. @BlueNote in Alberta, it currently sits at 370 which i know sits out of range for many, but the killer value is to highlight the comparison to other 25s. Most other 25 yr whiskies cost a fair bit more, and while there are a small number whose 25s are in the same price range or cheaper, but come nowhere close in terms of quality. I also have a conspiracy theory that a peat tax exists, and maybe its because there's only a light amount of peat but this bottle dodges that as well (imo). Another way I look at it - would i rather have 1 of these or 3-4x bottles of something else? (lets arbitrarily say a Lag16, an Abunadh, and a glenlivet 18) - heck yes i would take the 25 year talisker and not buy anything else for the next x months it takes me to catch up budget wise. I greatly enjoy the 10 and the 57N. Hopefully I'll have the means to try the older ones someday. @Mackstine The Alberta price is actually pretty good compared to the UK price. I am definitely swayed by your "one great bottle vs three pretty good bottles" argument. Cheers. @Mackstine Damn you! Now I have to taste it!